One of Kenny’s favorite things to grow in the garden are peppers. My brother-in-law Gregg turned us on to this great appetizer a few years ago (he uses cream cheese with chives for his) and we have been hooked every since. Kenny altered his creation so he can claim fame to these now. Try them out for yourself, once you start eating them you can hardly stop. Kinda like a Lays potato chip. Cut steams off peppers and cut them in half long ways, remove seeds from peppers. 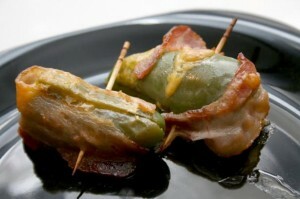 Fill each pepper with cream cheese, them wrap 1/2 slice bacon around each pepper half. Secure with wooden tooth pick and place on baking sheet. Place in 450 degree oven for 30 minutes or until bacon is fully cooked. Remove and serve when cooled down. ENJOY !